Now, you wouldn't believe the incredible bargains to be found in the Handmade By Suzanne store, so make sure you check it out! Click HERE to go straight to these papers and stickers I've used and see for yourself!! Sam, your family is in my thoughts. I hope you don't get too affected by the floods. 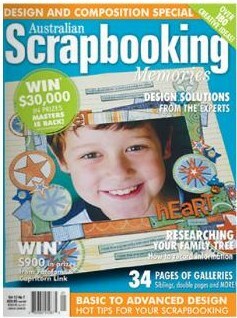 Scrapping is a great distraction. Love the LO, the Papers and embellies go so well together. I love how bright and funky this is Sam..continue to stay safe! This has to be the best Bella layout I have seen! Sam you are a stunner! Great creation! Such a pretty layout, and the colors are so bright. Love all the embellies you used. I hope your family stays safe. Your layout is gorgeous. I've thought about you and the terrible flooding. Happy to hear are alright. Hope your mom and dad are also. Must be tough with no water and power. Just love your bright and colorful layout! Love all of the details, especially those Purple Pumpkin buttons! Beautiful layout, such fun bright colors and great embellies!! So sorry to hear about all the flooding. Good dry thoughts coming your way. Flooding is so dangerous. Hope everyone can stay safe. So sad already. I love your entire page and that picture! I love your title, I think my girls have the same crazies. lol tfs I am going to check out her shop. Glad to hear you are ok Sam!!! Hi Sam, glad you guys are safe and hope your parents stay safe and have their power restored soon! It's unbelievable the damage that has been done. LOVING the gorgeous layout, you sure create wonderful layouts with paper I have NO idea how to use, thanks for the inspiration. What a gorgeous layout! I was so glad that you mentioned that you are out of harm's way from that horrible flood. I immediately thought of you when I saw the horrific scenes. So sorry to hear anyone has to be in that situation!!! Best of luck to all of the affected Aussies! Sorry to hear about your Mum and Dad....it's been such a heartbreaking situation!